Finally, back in the New Year with a brand-new recipe! How is everyone enjoying their first 15 days of the year? Mine have been pretty awesome so far; I turned 30 and went to several new restaurants. You guys know I love to eat. I’ll have new restaurant reviews and much more coming soon. Sorry. I’ve had a slow start to the year. It felt so good just to relax and disconnect for a while, ya know. Today I am going back to my roots with this new Meatless Monday recipe featuring chickpeas. I have been wanting to cook more Indian food, and, as it has it, Indian food is some of the yummiest vegetarian food ever! The weather has been V frigid lately – you know, wind, chill, snow, rain, sleet. ALL OF IT. So, a hearty curry is where it’s at to keep you feel warm and full. This curry is packed with protein and fiber heavy chickpeas, tomatoes, spices, lots of garlic and ginger and this dish will also help clear up any sinus issues with the homemade masala mixture. Play around with the spice level, serve over rice or with naan, and you have yourself an easy, weeknight curry. Indian food doesn’t have to be intimidating! You can find most of the spices you need at your local grocery store. If not, Trader Joes and Whole Foods and other specialty stores like them will carry the spices. Look for something sweet coming to the blog next week. Easy to make, flavorful and satisfying, vegetarian meal. Heat oil in a pot over medium heat. Once hot add onion, cumin, and salt to taste. Cook until onions are soft. 2-3 minutes. Add garlic, ginger, cilantro, and green chilies to a food processor and form into a paste. Add mixture to oil and continue to cook for 5 minutes. Add coriander, chili powder, and turmeric. Stir. Add a little more oil if the pan is looking dry. Add pureed tomatoes and chickpeas. Stir. Taste for salt and adjust as necessary. Bring to a boil. Once boiled, reduce the heat to low and let simmer uncovered for 15-20 minutes, stirring occasionally. When the masala has thickened taste for seasoning again. Adjust spice and salt as necessary. Remove from heat and add lemon juice and garam masala. Stir to mix. Oh yes! You can make this no problem! Thank you! Super easy to follow! this looks delicious! i never had it before, but the description is too great to ignore. This looks delicious! We always have a bag of chickpeas and this is a great dish to add to our rotation. You got me hungry early morning, its one of my favourite foods, more so in winters. And Now, i remember, its been a month that I have not made Chana masala with poori. I’m onto it for weekend ! I love poori!!! Great choice to eat it with. Ooooh yum! I love chick peas, this looks right up my street! Super healthy and packed full of proteins! The food looks delicious and your recipe is so healthy. I haven’t tried cooking Indian food but I’ll try to do this! Hope it turns out yummy, and thank you! It feels…OLD. HA! Congrats on the 30th birthday party. You look absolutely amazing I must say. Good to hear you were able to celebrate. I think it’s important to celebrate the time with the people who love us. I’ve never had chickpeas before!! I always thought they would be a little tasteless, but cooked like this I think they sound delicious! 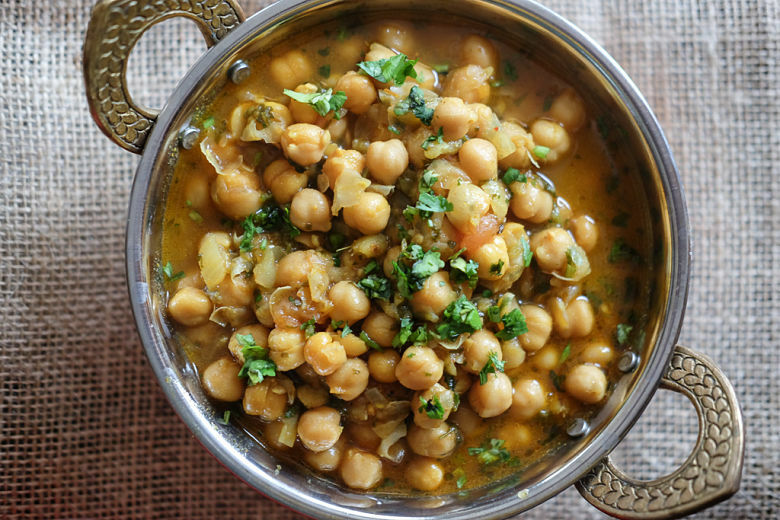 Chana masala is my personal favorite, it goes very well along with bread as well as rice. It is easy to cook and not so much spicy. I absolutely hate spicy food myself. Thanks for sharing the recipe and other details. Wow! this looks like a delicious vegetarian meal, chickpeas are pretty healthy too. I wanna try this too since I always love chili on my meals. Thanks for sharing this great post. I agree with you that Indian food has the best vegetarian options ever, although maybe I am biased as Indian food is my favourite cuisine. I had a chana masala on Friday but if it was up to me, I would have it everyday haha! I am definitely pinning your chickpea recipe for later, it might help me be better at making Indian food! I tried making this. it came out very well. Thanks.